Keep your property safe and secure with professional yellow jacket removal from Florida Bee Removal. While many of us enjoy the sight of a big, fat bumblebee buzzing through our flower garden and pollinating our beautiful buds, most of us do not enjoy the sudden sight of a yellow jacket! These stinging insects are often part of the insects that we all group together as wasps. Yellow jackets can be dangerous to people who are allergic to bees, as well as those who aren’t. Here at Florida Bee Removal, we want to tell you why we should be on your radar when it comes to yellow jacket removal. Professional. When it comes to skilled tasks, you want professionals to be there to assist you. 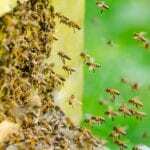 At Florida Bee Removal, we have made a full-time business out of working with these insects, and we want to keep you safe with our knowledge and professional tools. Experienced. We have been in the stinging insect removal business for over 50 years– talk about experience! We can differentiate between types of insects, help you determine which are harmful to your home and which just need removing, and find the most wilily of hiding nests. Safer for you. Yellow jacket removal can be especially hazardous because not only are their stings especially painful, but they also tend to move in swarms instead of smaller groups. The last thing you need on your property is thousands of angry, tiny yellow jackets. Reasonably priced. Ironically, apian tasks are one of the few that you actually spend more if you try to go the DIY route! Let us perform your yellow jacket removal for savings of time and money. If you suspect yellow jackets or are unsure of the type of stinging insect you have in your St. Petersburg, Florida property, we want to help. Contact us today and let us assist you with your yellow jacket removal.